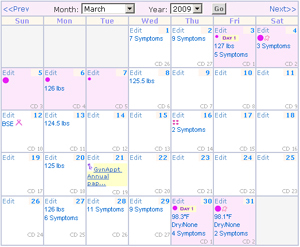 Menstrual Cycle tracker - track your periods and cycle symptoms. Fertility and Ovulation tracker - track daily fertility signs, tests, activity. Peri-menopause Tracker - Track menopause symptoms, cycle changes; Plus, hot flash journal. Daily Journal, weight tracker, and more. Not a member? Join Now! and use our free menstrual cycle tracking calendar. Free Enhancd Fertility Charting, including BBT charting, fertility phases reporting, chart-room to share and discuss your fertility cycle. Free ovulation calculator, menstrual period calculator, Is my period late calculator, pregnancy test calculator, pregnancy calculators, daily symptom forecast, and many more cycle calculators. Switch to the free period calendar anytime to quickly click track your periods and see your year in review.